MY LATE FATHER-IN-LAW probably bought this (and at least one other) chair surplus some 40-50 years ago for his office. A no frills chair, perfect for a cement mason or laborer to sit on when waiting for a paycheck. Somehow, the groundskeeper managed to hang on to two of them after he took over the business and now one has a new life. One of these chairs made its way to our house years ago and has been hanging out with the potting bench. 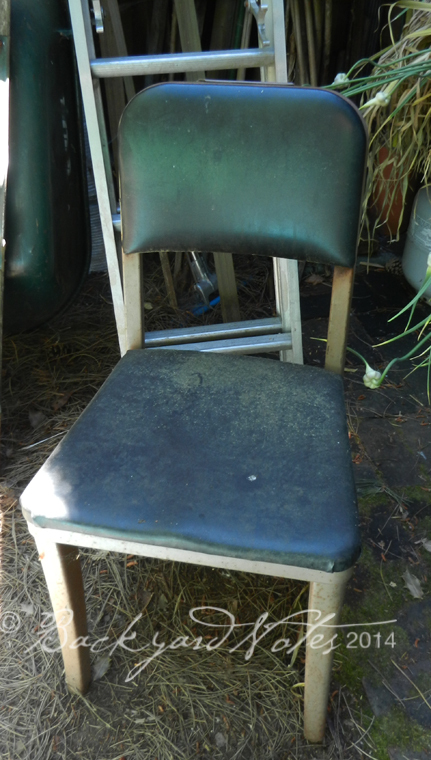 As a testament to the quality of its overall construction, the chair has rusted only slightly and the seat and seat back material has held up well too, in the elements. Three months ago we found a second chair in a storage room where the office used to be and I decided to bring it home and dress it up for the garden rather than scrap it to the metal guy who parks just outside the transfer station. 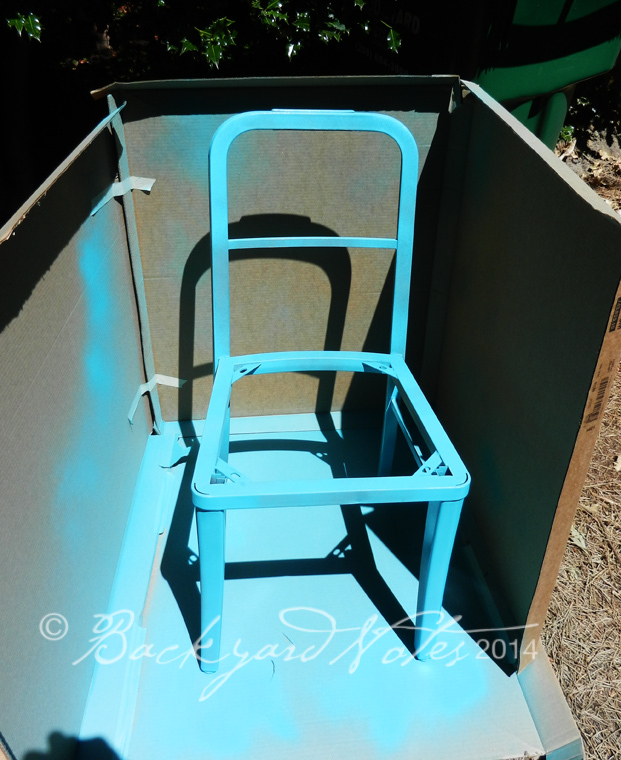 I sanded the frame to get rid of the rust, removed the seat and seat back and then gave the chair 1 1⁄2 cans worth of Rustoleum’s 2X Ultra Cover spray paint; they have some great, vibrant, colors for outdoor use. 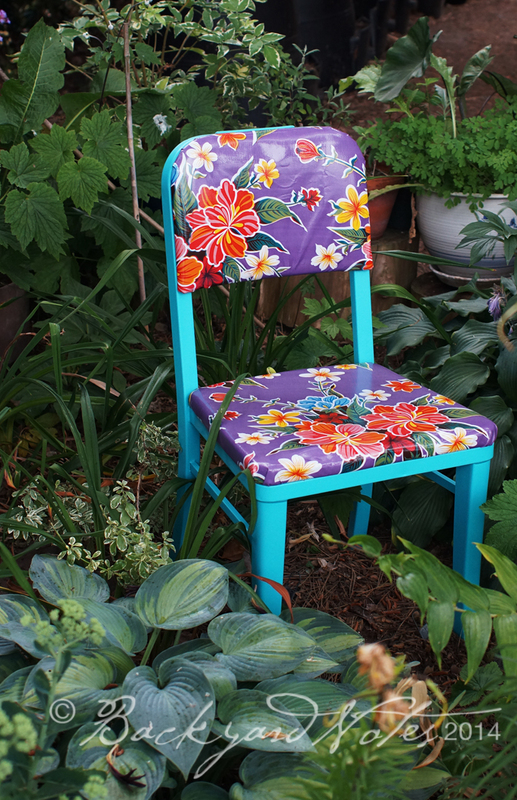 I found some great oil cloth prints at Pacific Fabrics, wrapped the new fabric around the old and I have a great chair in the garden. This so much fun that I am going to do the second chair; I found a ladybug print vinyl that called out to me! I BELIEVE THAT THE PEARS ARE NEARLY FINISHED! 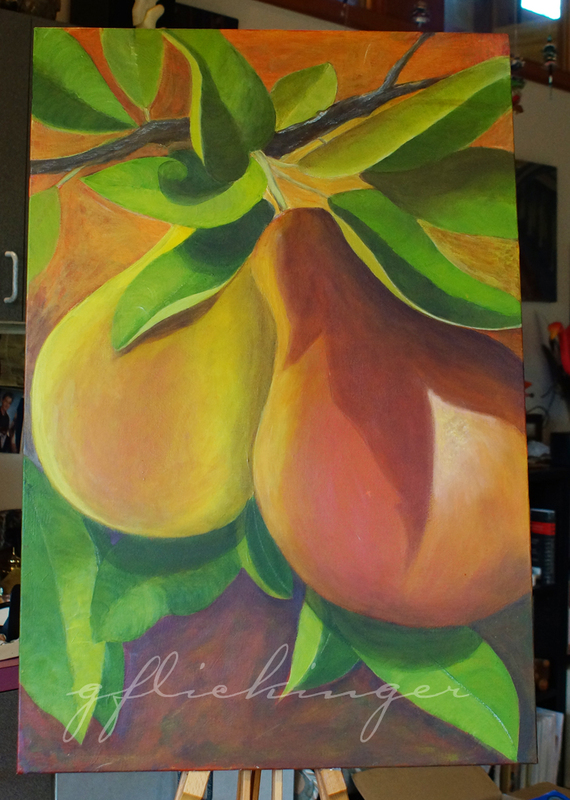 I may yet lighten the top portion, as to my mind it is still too similar to the forward pear and the lower background. Also, the yellow pear needs a little warming, rounding and shadowing at the bottom; it’s very close. 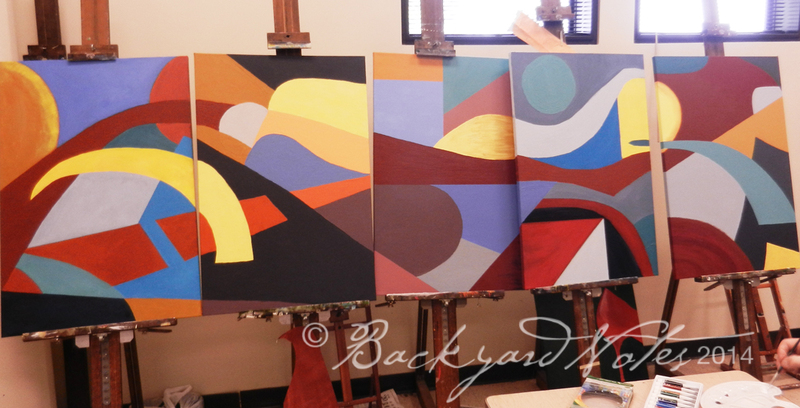 When my piece is finished, then four of the the five paintings will be complete; only the arrangement needs finalizing. The Abstract and Laden Table collaborations are complete. I am eagerly looking forward to the next project (solo, that is).